First appearance can be found clicking on this sentence. Driving to work on Monday morning I was lucky again to see a Wedge Tailed Eagle at the side of the road munching on something dead. I stopped as quick as I could. I fumbled around in my bag trying to find my camera, and in my excitement my lunch just spilled out instead! Once I got my camera and out of the car, the Wedgy had started to fly away! 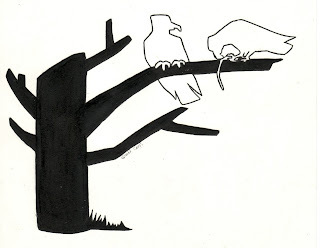 It flew into the distance to join another one on a branch, and inspired me to do this half silhouette picture. I must remember to have my camera ready and within grabbing distance, as I especially want a picture of these Wedgies!